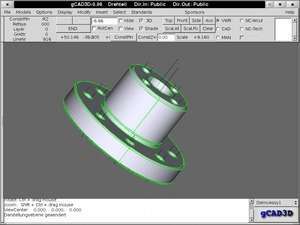 gCAD3D is an open-source 3D computer-aided design program intended for industrial design and other professionals requiring software like AutoCAD. For those familiar with AutoCAD-type programs, getting started with gCAD3D involved drawing to create 3D objects. The interface is also similar to other CAD programs. Though like any 3D design software, gCAD3D might seem complicated at first. Version 2.10 is a freeware program which does not have restrictions and it's free so it doesn't cost anything. For security reasons, you should also check out the gCAD3D download at LO4D.com which includes virus and malware tests. Additional screenshots of this application download may be available, too.